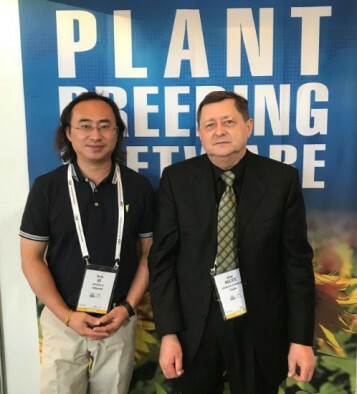 Left, Derek Gu, Zealquest, and, right, Dr. Dieter Mulitze, Agronomix, at the ISF World Seed Congress in Brisbane, Australia. Winnipeg, MB (September 5, 2018) - Agronomix Software, Winnipeg, Canada, is pleased to announce that as of July 23, 2018, Zealquest Scientific Technology, will be the exclusive distributor of Agronomix Software’s AGROBASE Generation II® Plant Breeding Software in the Peoples Republic of China and Taiwan. While meeting at the ISF in Brisbane, Australia, June 2018, Mr Derek Gu, CEO and Managing Director, Zealquest, and Dr Dieter Mulitze, CEO and Founder, Agronomix discussed the strategic alliance, also with Christopher Leonard, President, Agronomix Software. Zealquest Scientific Technology will undertake the marketing, training and local support for AGROBASE in China, as part of its growing plant breeding platform to support the plant breeding research at the government research centres, universities, and seed companies in China. Zealquest Scientific Technology Co., Ltd. was founded in 2000. Zealquest is a leading distributor and provider of high technology products and solutions that are used in Plant eco-physiology, Plant Breeding, Agricultural science, Soil science, Meteorology, Ocean and Freshwater research and monitoring fields. Recently, Zealquest has been expanding its plant breeding platform with high-throughput DNA extraction and SNP/Gene marker analysis. Agronomix is excited about the future of this alliance, given Zealquest’s strong presence and solid reputation in China through its offices in Shanghai, Beijing, Chengdu, Guangzhou, Wuhan, Haerbin and Urumqi. Key to this alliance is Zealquest’s strong scientific collaboration with plant breeding research and long term commitment to the growing seed industry in China. While in Shanghai in July, Dr Mulitze toured Zealquest’s impressive Agripheno high throughput plant phenotyping centre, the largest one in Asia and now providing phenotyping and related services most notably for many government research centres throughout China. Agronomix Software, Inc., founded in 1990, is a leading software development company providing plant breeding software solutions for plant breeders now in over 40 countries. AGROBASE Generation II is a comprehensive plant breeding software solution designed for many different crops and breeding systems, developed with input from plant breeders globally for almost 30 years. The software is arguably the most relational database system for plant breeding on the market, offering unique value and possibilities for breeders. With almost 1,200 individual users registered in the Learning Centre on the company’s web site to view the over 120 online AGROBASE tutorials, users can maximize their ROI. The company offers on-site private training, regional training courses (Canada, US, Australia, Germany annually), on-line training and software customization. The expanding software development team includes a mandarin speaking SQL developer with a BSc in computer science from Harbin University, China, which will facilitate technical collaboration with Zealquest Scientific Technology.